"You's makin' this up outen yore head because yore a poor gal who's still mizzubly in love with me. Fo' which ah cain't blame you, cuz I can see how it could happen." Al Capp's highly-popular comic strip of hillbilly humor set in Dogpatch, Arkansas, had a legendary run for decades, for many years centering on the eternal pursuit of giant man-child Abner Yokum by voluptuous Daisy Mae in the annual Sadie Hawkins Day races. The strip had a huge cultural influence from the 1930s through the 1950s, even though it's largely forgotten today. Two film adaptations were made at the strip's popular heights, the first one a mostly forgettable effort. Much better is this musical version, which beautifully captures the flavor of the comic. Abner (Peter Palmer) has a rival for the affections of Daisy Mae (Leslie Parrish) in the form of the world's dirtiest wrassler, Earthquake McGoon (Bern Hoffman). Either one is fine with itinerant preacher Marryin' Sam (Stubby Kaye), but before the Sadie Hawkins Day race that will allow Daisy Mae to choose Abner, Sen. Jack S. Phogbound (Ted Thurston) announces that Dogpatch has received the honor of being the test site for U.S. Army nuclear weapons and must be evacuated. But that means the destruction of the Yokumberry tree of Mammy Yokum (Billie Hayes), the berries of which in tonic form caused the extraordinary growth and power of Abner. General Bullmoose (Howard St. John) gets wind of this miracle tonic and conspires with Appassionata Von Climax (Stella Stevens) to get his hands on the formula. In the meantime, McGoon has plans of his own for winning Daisy Mae. There's a ton of plot here, especially for a musical, and this synopsis barely scratches the surface, but it's a faithful rendering of the often-convoluted storylines of Capp's comic. Examples of such adventures that get properly translated to the screen here are the fish-out-of-water sequences of Abner in the city as well as city folks in Dogpatch. The homespun humor with a political bite is also faithful to Capp's original, and the look of the picture is even more so, with a stagey appearance that is highly cartoonish and brightly colored. But the most faithful element is the appearance of the characters, who are amazing replicas of the comic, with Abner towering over his miniature parents. Many of the stars were reprising their roles in the musical from Broadway, including Palmer, Kaye, St. John and Billie Hayes, among others. Palmer really captures the lunkheaded nature of the title character, and Stubby Kaye perfectly embodies Marryin' Sam. Billie Hayes, best known as Witchiepoo from H.R. Pufnstuf, is terrific as the crotchety Mammy Yokum. And most notably, Julie Newmar is simply stupefying on the screen as secret weapon Stupefyin' Jones. Without any dialogue or singing in a musical comedy, she's easily the most memorable element of the picture in a star-making silent performance that takes firm advantage of her dance background and her physical attributes. It's a star-making performance even though she has barely five minutes of screen time. The main weakness here is the songs themselves. Other than a song paying tribute to Dogpatch founder Jubilation T. Cornpone, which is pretty catchy and entertaining, the tunes are mostly not memorable or particularly engaging. Johnny Mercer is credited with the lyrics, but they're not the great songwriter's finest hour, particularly in the opening songs that laboriously provide exposition and introduce the characters in a most awkward fashion. The singing is generally acceptable, and the dancing is first-rate, even though the stage choreographer Michael Kidd didn't come to the film version. Although the music is a shortcoming, the package is pretty entertaining in a number of respects and well worth watching despite quite a few politically incorrect elements in the Dogpatch gender relations. Image Transfer Review: The 1.85:1 Vistavision picture is eye-popping for the most part, demonstrating one of the most appropriate uses of the excesses of the Technicolor process. The source material is in excellent condition, although some reels seem slightly out of focus. Close examination indicates that these are the result of the three-strip Technicolor not being perfectly in registration; occasionally blue or red fringing can be seen. A digital restoration that recombined these strips could have made this look fabulous, given that quite a few sequences look vivid and perfectly sharp where the registration is nicely lined up. Audio Transfer Review: The original mono audio is represented by a 2.0 mono here. Although there's moderate hiss, it's not distracting. Range is very good, though bass is a bit lacking in comparison to the treble registers. Dialogue is always clear. Extras Review: There are no extras. Chapter stops are poorly placed and do not give direct access to any particular song. Chapters are also rather long and don't permit for easy access of all of Newmar's scenes. 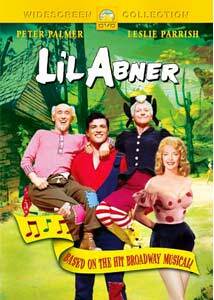 An entertaining musical comedy, despite a weak score, that vividly brings Al Capp's comic strip to life. The transfer is very good, though some segments could use restoration of the Technicolor elements. Zero extras, but prepare to be stupefied.